Red Dead Online will be receiving a large update on February 26th, Rockstar Games announced today. This update will add new daily challenges and rebalance some weapons. It will also implement some of the changes Rockstar first revealed back in January. 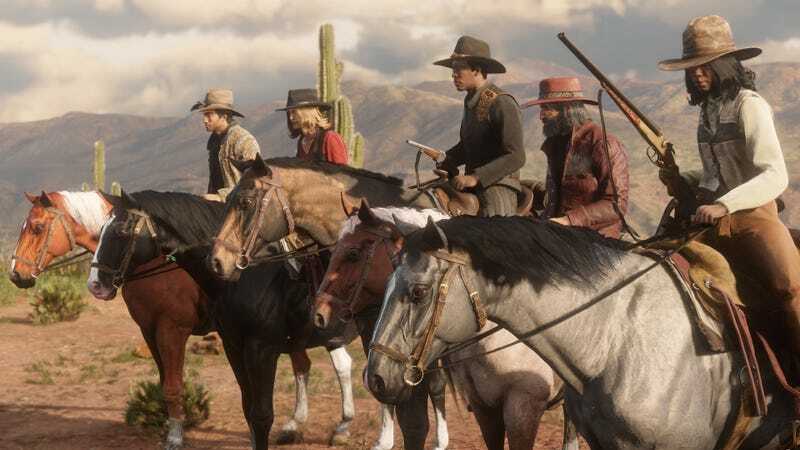 In their news post, they explained in more detail how many of these changes will work and how they hope the changes will improve Red Dead Online. After a rough launch, Red Dead Online fans have continued to voice their concerns about the in-game economy, lack of missions, griefing and other problems. The upcoming update seems focused on trying to fix some of the biggest issues fans are currently having in RDO. Rockstar wrote that it’s hoping to “minimize certain destructive player behaviors.” This seems to be a more elegant way of saying “We are going to stop assholes from being so annoying.” Currently player blips, indicators of where players are in the game’s world, can be seen on the map at all times and at any distance, allowing players to target others no matter where they hide. Following the February update, player blips will only show up if players are within 150 meters of each other. If a player is farther away than 150 meters, they won’t appear on your map unless they fire their weapon. Rockstar is also implementing a system that will highlight players who are overly aggressive. As players act more aggressively, such as through killing other players or their horses, their player dot will become a darker shade of red. More laid-back and less violent players will stay a bright blue color. This system sounds very similar to GTA Online’s Mental State mechanic. Like that system, players in RDO will also be able to change their dot color from red back to a more peaceful blue if they calm down and stop killing other players for a bit. Another step Rockstar will take to help limit how often players are killed by aggressive trolls is that, after the update, players will be able to parlay with an entire posse. Currently, if a troll keeps killing you, the game will allow you to parlay with them, which means they can’t hurt or kill you for a certain amount of time. However, in the current system, the aggressive player’s posse can still attack you. The new posse parley will help keep roving bands of trolls from frustrating smaller posses or peaceful solo players. Rockstar has also confirmed that this next big update will add bounties into the game. A player who is overly aggressive and breaks the law often will eventually have a bounty placed on their head. Unfortunately, it seems players can’t hunt these bounties. Instead, when your bounty gets high enough, NPC bounty hunters will hunt you down and try to kill you. Not all crimes will earn players a bounty on their head. While killing another player or their horse will quickly bring bounty hunters after you, attacking random NPCs or farm animals won’t be as seriously punished. Some crimes, like small-time robbery, won’t even earn you any amount of bounty, but instead will lower your honor. It seems like a missed opportunity to not allow other players to become temporary bounty hunters who can hunt down aggressive players. In a game that is lacking content, this could have been a great way to add something new to free roam. Red Dead Online’s February update will add daily challenges into the game. These challenges will cover many different activities in Red Dead Online, asking players to kill bandits, collect herbs, hunt animals, sell stolen goods and more. Rockstar also plans on adding more challenges in future updates. Completing these challenges will unlock new rewards and bonuses. Rockstar will also be balancing some weapons, specifically the Varmint rifle. The popular small caliber rifle will have its accuracy dropped, making it less effective in long range encounters. Though Rockstar only gave the Varmint Rifle as an example, the post says that “based on community feedback received thus far, select weapons will be re-balanced.” This hopefully means tweaks to other firearms and weapons. Rockstar also explained that it’s making changes and fixes to the way horse cargo works. Players currently deal with all manner of problems when storing skins and pelts on their horses, with these items sometimes vanishing after players die or fast travel. Rockstar wrote that “fixes to horse cargo are numerous,” though the developer didn’t specify what the changes will actually be. These new changes and fixes couldn’t come soon enough. Many players are increasingly disappointed in their Red Dead Online experience and are wanting more improvements from Rockstar. Hopefully these changes will help alleviate some of the issues RDO players are dealing with when playing online.